social media platform on the planet? in just minutes a day. Quickly and safely build a huge and high quality army of clients and customers who are 100% targeted to your business. Effectively contact your new and existing clients and customers in order to scale your business into a whole new level of success. 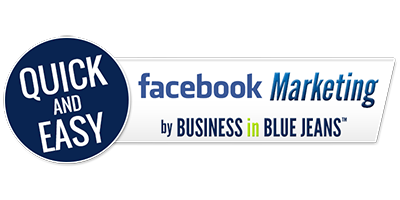 Ensure a consistent stream of income potential for your business using Facebook. Read on…I’m about to show you how you can become a fast Facebook Expert, easily tapping into the hottest social network on the planet to skyrocket your business. These days, the success of your business depends not only on the quality of traffic to your web site, but largely on the social recognition and interaction that your business gets. …if you don’t give off the right social impression, your business will fail! Do you really want to make the most out of the most well-trafficked social platform ever (Facebook), but don’t know when or how to do it? Is your Facebook Page brand new, and you’re scared that visitors can see that no one (or few) has liked your page yet? Do you already have a solid number of Facebook Likes (followers), but don’t know what to do with them so you don’t start losing them? Bottom line: if people trust more in recommendations than in the ads you’re creating to market your business, then the right information needs to be showing up as people are sharing your business via that all-important, powerful viral, word-of-mouth marketing. Want your business to still be around in 5 years? Then now’s the time to get serious about social media. No more worrying about wasting your time in social media. No more worrying about old or ineffective Facebook marketing strategies that are still out there, being taught. I’ve made this guide to teach you how to use Facebook the right way, the way that will actually help you grow your business…step by step. 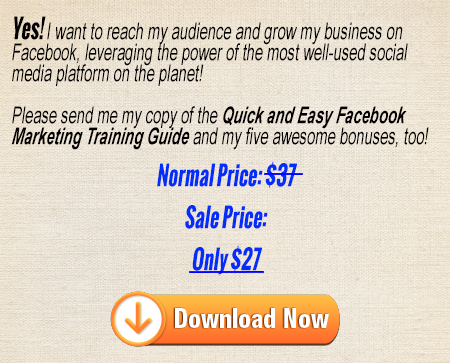 It takes eight very easy-to-follow steps to get where you want to be, leveraging the viral power of Facebook. 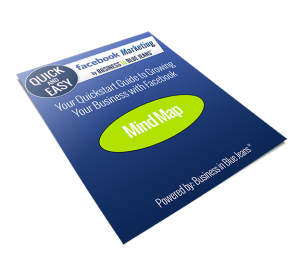 Quick and Easy Facebook Marketing will take you from zero to hero, even if you aren’t a technical whiz! I’ve designed this Facebook Training to show you the exact 8 steps that you need to strongly and safely position your business on Facebook in just a few hours. A detailed explanation of Facebook Pages. Examples of successful Facebook Pages. The most important step you need to take right before building a Facebook Page for your business. The one question you must be able to answer to choose the right approach to Facebook for your business. Important stuff you need to know before you register your Facebook Page Account. Tips to create a highly effective profile image. Important tips to get the most out of your About section that even the “big boys” forget. How to effectively use the top 5 posting activities to spread the word virally and quickly. 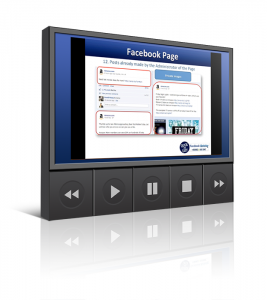 How to use one of the most powerful functions on Facebook to grow your online presence. Super-effective strategies to make your posting activities way more productive. That’s right, I’ve recorded ten videos, showing you everything I teach you in the training guide, step-by-step. That way, if you learn better by doing, just follow along in the videos and do everything along with me. Now do you see why I’m calling it Quick and Easy Facebook Marketing? You’ll get to see behind-the-scenes stuff as I’m doing it, step-by-step. I’m practically holding your hand to walk you through this stuff! How to get the most out of your web site traffic to get a lot of likes very easily. How to get the most out of email marketing to get a lot more new likes. Page that almost no one is using! Now and when to schedule your posts (without sacrificing engagement). A powerful technique to increase your clients’ and customers’ loyalty. How to effectively optimize your Facebook page for search engines. Step-by-step tips for using a special function that only Facebook has. 4 highly effective ways to maximize list-building and lead capture on Facebook. It breaks up the entire training into easy-to-follow steps, so that you can make sure you keep track of every piece of advice I give you in the training, helping you to track your progress and reach your goals. This printable mind map outlines the entire training, to give you an overview of every step you’re going to apply. *Tip: It’s easier to use if you print it out. 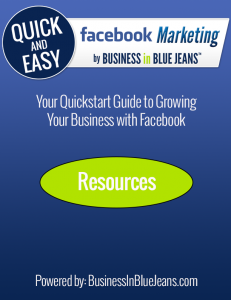 This resource guide provides all the resources you need to get your Facebook Page growing quickly and beyond your expectations. In addition to further training, you’ll also discover services that can make your Facebook Page even more extraordinary and interactive, plus professionals who can take care of all of your Facebook graphics and programming needs. The tips and tricks that I’ll teach you are the exact same ones that I have used to correctly position my business on Facebook and gain over 8,300 “likes,” follower, and friends. Facebook is extremely easy to manage. It’s just like anything else in life: before you know how to do it, it seems difficult and complicated and time-consuming. But once you know where everything is and how to use it, things get a lot easier. In this course, I’m taking you by the hand and showing you everything you need to know to grow your business and leverage the power of Facebook, step-by-step, in just a few minutes a day. This training program is a great way to become acquainted with Facebook, learn how to use it, and use the most effective strategies and techniques available. How much would it cost to get your business in front of thousands of people who are looking for you? And on Facebook, most of what you’ll do is free. Save yourself the angst of worrying about how to use Facebook, the stress of a Facebook Page that isn’t growing, and the hours you’ve wasted on techniques that don’t work, and focus on the strategies that do work. I could sell this for more, but what’s important to me is that you know how to use Facebook and use it well. So I’m keeping this product as low as I can. 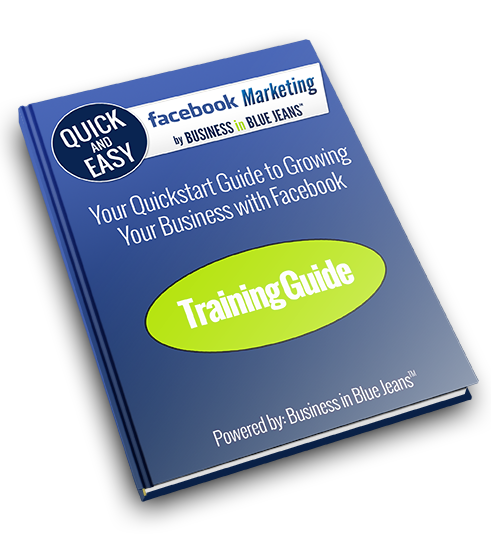 Download “Quick and Easy Facebook Marketing” today. Simply click on the button below, and within just a few seconds, you’ll be watching your first video!